Description Our Kindle e-books and 26+ hours of Inner Circle videos help real business owners to build valuable, long-term digital growth. This audiobook accompanies our Week #26: Offline Meets Online Kindle e-book and the Week #26: Offline Meets Online video inside the Inner Circle. The post 26WP Week #26: Offline Meets Online [AUDIOBOOKS] appeared first on 26-Week Digital Marketing Plan. This audiobook accompanies our Week #25: Feeder Brands Kindle e-book and the Week #25: Feeder Brands video inside the Inner Circle. The post 26WP Week #25: Feeder Brands [AUDIOBOOKS] appeared first on 26-Week Digital Marketing Plan. This audiobook accompanies our Week #24: Apps & Magazines Kindle e-book and the Week #24: Apps & Magazines video inside the Inner Circle. The post 26WP Week #24: Apps & Magazines [AUDIOBOOKS] appeared first on 26-Week Digital Marketing Plan. This audiobook accompanies our Week #23: E-Books & Document Sharing Kindle e-book and the Week #23: E-Books & Document Sharing video inside the Inner Circle. The post 26WP Week #23: E-Books & Document Sharing [AUDIOBOOKS] appeared first on 26-Week Digital Marketing Plan. This audiobook accompanies our Week #22: Podcasting Kindle e-book and the Week #22: Podcasting video inside the Inner Circle. The post 26WP Week #22: Podcasting [AUDIOBOOKS] appeared first on 26-Week Digital Marketing Plan. This audiobook accompanies our Week #21: Video Marketing Kindle e-book and the Week #21: Video Marketing video inside the Inner Circle. The post 26WP Week #21: Video Marketing [AUDIOBOOKS] appeared first on 26-Week Digital Marketing Plan. This audiobook accompanies our week #20: Affiliate Marketing & Partnerships Kindle e-book and the week #20: Affiliate Marketing & Partnerships video inside the Inner Circle. The post 26WP Week #20: Affiliate Marketing & Partnerships [AUDIOBOOKS] appeared first on 26-Week Digital Marketing Plan. This audiobook accompanies our week #19: 2nd Tier Links & Social Signals Kindle e-book and the week #19: 2nd Tier Links & Social Signals video inside the Inner Circle. The post 26WP Week #19: 2nd Tier Links & Social Signals [AUDIOBOOKS] appeared first on 26-Week Digital Marketing Plan. This audiobook accompanies our week #18: Guest Posts & Authorship Kindle e-book and the week #18: Guest Posts & Authorship video inside the Inner Circle. The post 26WP Week #18: Guest Posts & Authorship [AUDIOBOOKS] appeared first on 26-Week Digital Marketing Plan. This audiobook accompanies our week #17: Blogger Outreach Kindle e-book and the week #17: Blogger Outreach video inside the Inner Circle. The post 26WP Week #17: Blogger Outreach [AUDIOBOOKS] appeared first on 26-Week Digital Marketing Plan. This audiobook accompanies our week #16: Competitor Backlinks Kindle e-book and the week #16: Competitor Backlinks video inside the Inner Circle. The post 26WP Week #16: Competitor Backlinks [AUDIOBOOKS] appeared first on 26-Week Digital Marketing Plan. This audiobook accompanies our week #15: Local Search & Reviews Kindle e-book and the week #15: Local Search & Reviews video inside the Inner Circle. The post 26WP Week #15: Local Search & Reviews [AUDIOBOOKS] appeared first on 26-Week Digital Marketing Plan. This audiobook accompanies our week #14: Directories & Curated Lists Kindle e-book and the week #14: Directories & Curated Lists video inside the Inner Circle. 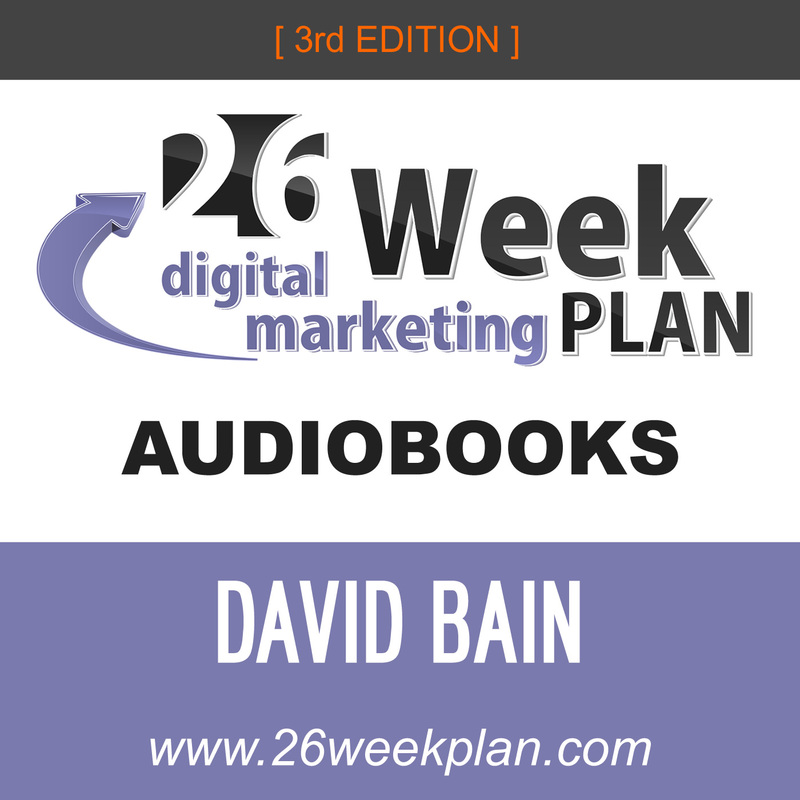 The post 26WP Week #14: Directories & Curated Lists [AUDIOBOOKS] appeared first on 26-Week Digital Marketing Plan. This audiobook accompanies our week #13: Online Reputation Management Kindle e-book and the week #13: Online Reputation Management video inside the Inner Circle. The post 26WP Week #13: Online Reputation Management [AUDIOBOOKS] appeared first on 26-Week Digital Marketing Plan. This audiobook accompanies our week #12: Pay Per Click Advertising Kindle e-book and the week #12: Pay Per Click Advertising video inside the Inner Circle. The post 26WP Week #12: Pay Per Click Advertising [AUDIOBOOKS] appeared first on 26-Week Digital Marketing Plan. This audiobook accompanies our week #11: Press Release Distribution Kindle e-book and the week #11: Press Release Distribution video inside the Inner Circle. The post 26WP Week #11: Press Release Distribution [AUDIOBOOKS] appeared first on 26-Week Digital Marketing Plan. This audiobook accompanies our week #10: Content Syndication Kindle e-book and the week #10: Content Syndication video inside the Inner Circle. The post 26WP Week #10: Content Syndication [AUDIOBOOKS] appeared first on 26-Week Digital Marketing Plan. This audiobook accompanies our week #9: Social Media Management Kindle e-book and the week #9: Social Media Management video inside the Inner Circle. The post 26WP Week #9: Social Media Management [AUDIOBOOKS] appeared first on 26-Week Digital Marketing Plan. This audiobook accompanies our week #8 Business Blogging Kindle e-book and the week #8 Business Blogging video inside the Inner Circle. The post 26WP Week #8: Business Blogging [AUDIOBOOKS] appeared first on 26-Week Digital Marketing Plan. This audiobook accompanies our week #7 Opt-In Email Marketing Kindle e-book and the week #7 Opt-In Email Marketing video inside the Inner Circle. The post 26WP Week #7: Opt-In Email Marketing [AUDIOBOOKS] appeared first on 26-Week Digital Marketing Plan. This audiobook accompanies our week #6 Visitor Analytics Kindle e-book and the week #6 Visitor Analytics video inside the Inner Circle. The post 26WP Week #6: Visitor Analytics [AUDIOBOOKS] appeared first on 26-Week Digital Marketing Plan. This audiobook accompanies our week #5 On-Site SEO Kindle e-book and the week #5 On-Site SEO video inside the Inner Circle. The post 26WP Week #5: On-Site SEO [AUDIOBOOKS] appeared first on 26-Week Digital Marketing Plan. This audiobook accompanies our week #4 Authority Content Kindle e-book and the week #4 Authority Content video inside the Inner Circle. The post 26WP Week #4: SEO Keyword Research [AUDIOBOOKS] appeared first on 26-Week Digital Marketing Plan. This audiobook accompanies our week #3 Website Framework Kindle e-book and the #3 Website Framework video inside the Inner Circle. The post 26WP Week #3: Website Framework [AUDIOBOOKS] appeared first on 26-Week Digital Marketing Plan. This audiobook accompanies our week #2 SEO Keyword Research Kindle e-book and the week#2 SEO Keyword Research video inside the Inner Circle. The post 26WP Week #2: SEO Keyword Research [AUDIOBOOKS] appeared first on 26-Week Digital Marketing Plan. This audiobook accompanies our week #1 Kindle e-book and the week#1 video inside the Inner Circle. The post 26WP Week #1: Competitor Analysis [AUDIOBOOKS] appeared first on 26-Week Digital Marketing Plan.